« Are you getting enough negative feedback? This is the first of a series of posts where I’ll be looking at potential improvements to products. I point this attention to outside the app because the consumption experience and sharing capabilities inside the app are pretty good. There are always opportunities for tweaks and optimizations, but some higher impact changes can potentially be made in the areas of discovery and sharing when users are outside the app. I think the Pocket team knows this, as they recently began sending a weekly email to users with a few suggestions of popular items that you may be interested in. This email is aimed at increasing engagement via discovery of new content, potentially resulting in more items being added to Pocket. So now Pocket has made advancements with discovery outside the app, but what’s still missing for me is a nudge to share content more than I currently do. I rarely share content via Pocket with others. I use the app for a few minutes at a time (such as when I’m on the subway), so my focus is on reading what I have time for and then moving onto something off my device (such as getting off the train). Sharing doesn’t need to only take place inside the app — I’d explore a way to get users to share items when they’re not using the app. The goal here is to increase virality through users sharing items. 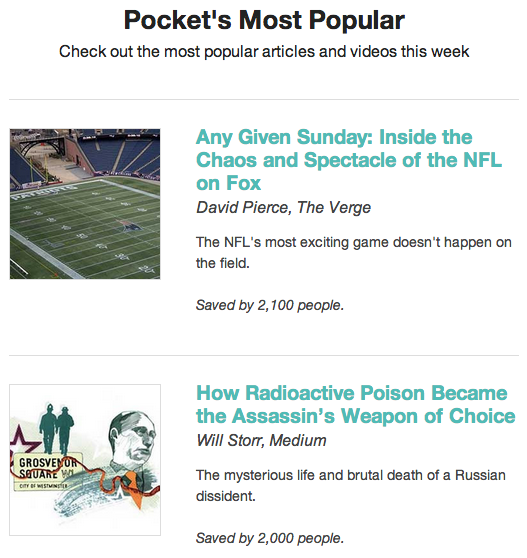 More items shared = more potential new users of Pocket. I’d experiment here with a periodic email sent to users that nudges them to share items that they’ve already consumed. This is different from the ‘discovery’ focused email described above, as here the user is already familiar with the content (it’d be a few items they’ve consumed within the past week) and can make a quick decision to share it. In some cases a user will have only consumed articles and no videos, or vice versa, but here we’ll assume it’s both. Depending on which metrics are most important to Pocket, the results of this new ‘sharing’ email (the goal being to increase user acquisition via some of the people who receive a shared item) could trump the results of the existing ‘discovery’ email (the goal being to increase engagement from the primary user). One option is to combine the ‘discovery’ and ‘sharing’ emails to introduce a couple of new items to the user along with a couple of already-consumed items that they may want to share. This could be tested. Success would primarily be determined by new users that resulted from the shares. 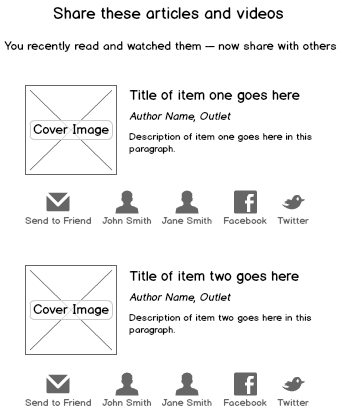 A secondary benefit would be increased engagement by existing users who either share items or receive shared items. Posted on December 23, 2013 by Lonnie Rosenbaum. 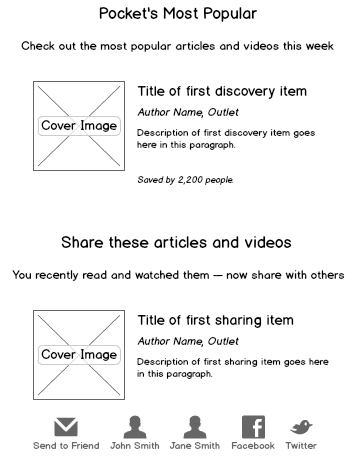 This entry was posted in Uncategorized and tagged product, product improvements. Bookmark the permalink.